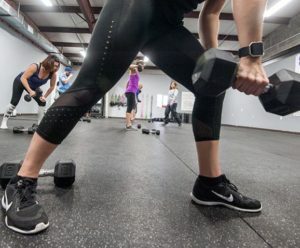 StrongFigure Bootcamp is offering a limited time, 90-day “Spring Break College Membership Special.” Students who show a current college ID are able to purchase 90 days of unlimited bootcamp classes for $90. This is a steal, and will only be available to purchase now through May. Burn Fat: Each StrongFigure Bootcamp workout burns roughly 600+ calories by utilizing the HIIT (high intensity interval training) method in order to maximize calorie burn throughout the day. HIIT increases your muscles’ ability to burn fat for energy, helps you to shed unwanted body fat, and also helps improve your overall quality of life. Build Muscle: StrongFigure Bootcamp uses both strength training plus high intensity interval training, which not only builds lean muscle but research shows that such proper training improves insulin sensitivity in the muscles, which helps your body to better process and absorb nutrients from the food you eat. The same research found that HIIT increases your muscles’ ability to burn fat for energy. Lean muscle not only looks good and helps you to shed unwanted body fat but lean muscle also helps improve your overall quality of life. his type of training improves overall metabolic health. A healthy metabolism is critical to reach your weight loss goals. Gain Energy: Our style of training will improve your metabolic health and improve your insulin sensitivity, which means you will have more energy. The muscles learn to use glucose for energy instead of storing sugars as body fat. You will feel better, become leaner, and grow stronger with effective interval training. Take advantage of this membership special and also receive our Spring Break Nutrition Guide for FREE. *Once you sign up, please download the app Zen Planner so that you can start reserving your class times online. If you have any questions, please contact Stephanie.